You may have noticed that we launched yesterday our PyGo devices on Kickstarter. This is a very exciting moment for Pycom. Whilst we could have settled for limiting our development to our core developer boards and OEM modules, it has become apparent that many of our customers still struggle to get products to market in short periods of time. In fact, a quick analysis shows that typical development cycles for IoT companies takes circa 18 months. Even after the number of tests, industry and network certifications carried out by Pycom, you still end up with a lengthy development journey. This is the reason for bringing the PyGos to life! In addition, many of you have approached us for help taking your concept idea to a production ready product and as we know, IoT deployment does not start with 100k unit volume. When facing many of the ramp-up charges for a volume of 100 to 1k units, the setup costs can often kill a project. Even when you have the funding for 1k units, the certification costs and delay are then looming at the end of the project. We therefore wanted to create a product which would help avoid such costs. A product which was fit for purpose and scalable from POC stage to early deployment. Meet the PyGo! There are 2 versions: PyGo1 (LoPy4 in disguise) and PyGo2 (FiPy) both of which are IP67 rated, 420 mAh battery, wireless charging circuitry (Air Fuel), OLED, accelerometer (which should be upgraded to an IMU) and a GPS module. In fact we have crammed so much in, that the antennas will be integrated not only in the module sides but also into the battery side. We will also expose tiny pins to use the clips as further antennas. These pins will then connect to the Enterprise cradle to allow you to run 2 external antennas via the u.fl connectors (LoRa/Sigfox and LTE-M). The Enterprise cradle (see photo) will also act as a wireless charging base (powered by your PCB). You can continue the same development tools you are enjoying right now as transferring the code will be done OTA (so no wires required). The Enterprise cradle will allow for a total of 8 universal inputs/outputs with digital/analogue capabilities so that you can connect different types of sensors and actuators from your own PCBs. Inside this cradle will be an ESP32 chip using BLE connectivity to the PyGo modules to transmit wirelessly your data. 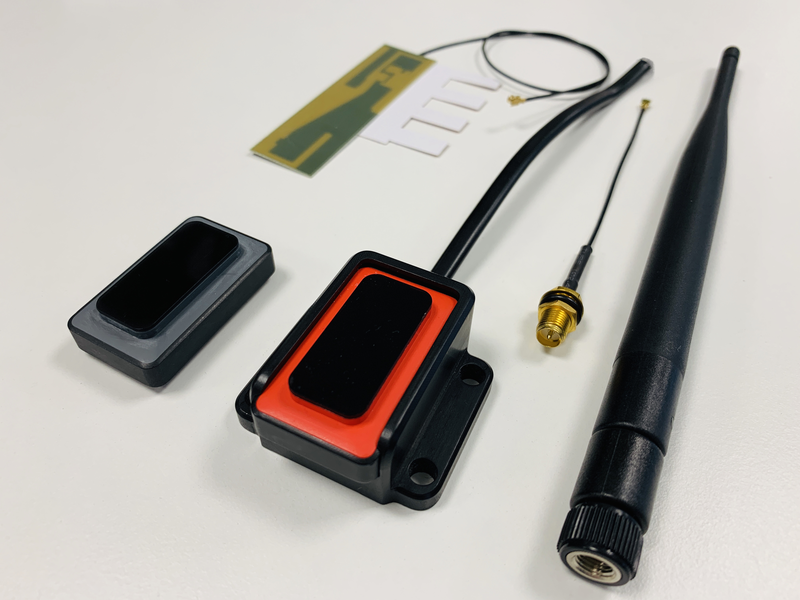 In terms of connectivity options, the devices will support BLE, WiFi, LoRa (Sigfox as the chip allows for this) and, in the case of PyGo2 modules, LTE-M. We have teamed up with both Verizon and Vodafone to offer you CAT M1 (North America) and NB-IOT (Globally). The SIMs will be embedded and you can cancel after 6 months. We are engaged with other operators and will have further news shortly. Obviously, the modules will have mesh technology (LoRa) thus enabling thread based LoRa connectivity amongst deployed PyGos. Range depends on location etc but expect distances of between 2Km to 12Km. That’s it! Lots to convey to our community and hopefully, the spirit behind the campaign becomes clearer. Hope you back this campaign and help bring PyGo to life! Q2. If a message can't be delivered (after multiple retries) to a destination, it will be stored on the Sender node, and retried when network information about Destination will be provided. We could also store it in the Cloud if Sender allows (option configurable by owner of Sender in Pylife mobile app). Q1. An experiment that I've did was sending a 6KB file between 2 neighbours Nodes in Mesh (2 nodes connected by direct radio link). This was accomplished in 19-21 seconds. A 250Bytes (chunk from the test-file) is sent on UDP socket, and split 3 packets (due to 6LoWPAN) of 127+127+97 = 351bytes, each packet followed by an ACK packet sent at Layer2 (MAC 802.15.4) each of 5Bytes = 15Bytes. As I've implemented a naive protocol, each 250Bytes, is followed by an ACK pack 33bytes (UDP level), itself followed by a 5B ACK packet MAC layer. So, in total for a 6KB file, 10.1KB actual bytes are sent between 2 nodes, obtaining an actual data-rate of 80800bits/19sec = 4252bps, which is close to the 4690bps Nominal rate of 125SF7 Lora modulation. Conclusion is that I've used 90% of the Lora airtime (ok, split by 2 Nodes, so we could average 45% airtime usage, though it's not symmetrical). I hope I'm not wrong, but to obey the 1% duty-cycle, the speed will just decrease proportionally. @peekay123 Hi, The Cradle is an integral part of the proposition which we will bring to life when the campaign is funded. 1.) LoRa airtime is restricted by regulations by law. So can you tell us something about the maximum of information transmission volume per 1 hour, when using the integrated LoRa meshing function? 2.) Will messages be stored temporarily, until a PyGo has contacted another node for a certain amout of time and then hop the stored message? Thinking of eg. communication net between busses or so. @fred, when will the Enterprise cradle become available? Are there any plans to offer CAT M1 to Canadian customers?